February 19, 2018 - Like us now! Earning Bitcoin has become easy now, shame all those crypto-miners have to work hard in the past. As you already know, people have to trade or mine to get their hands-on their favorite crypto. Stealing — crypto-jacking is another option, but this is out of the question right now. Here we are concerned about a new way of earning Bitcoins and the way is devised by an Austrailian company Boost Juice, which is popular for its juices and smoothies. 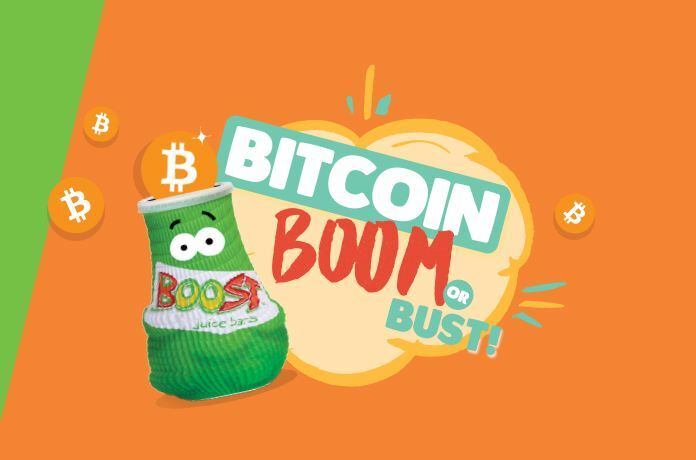 The company has announced in a Facebook post that it will be giving away four bitcoins, once a week, for consecutive four weeks to those who buy some juice and enter a code in the iOS or Android app of Boost. The company has partnered with Coinjar, an Australian cryptocurrency exchange that allows users to buy and sell Bitcoin, Ethereum, Ripple, and Litecoin. Bitcoin has some major design flaw, including its vulnerability to being used in crimes, energy consumption in mining and hack attacks. The blockchain is the purest system of the transaction but there are other alternatives like China’s Alipay or India’s unified payment interface which are backed by the governments and are reliable. With more comanies showing interest in cryptocurrencies and blockchain, like gaming company Atari which cited a rise in share price by 60% after its recent announcement, Boost Juice, might also looking forward to get something out of it by gambling with a sweet deal. Over 50,000 Snapchatters are facing “phishing attacks”!